Tea drinkers rejoice! Now you can enjoy a proper cuppa of loose leaf tea on-the-go with our Travel Tea Infuser Mug. The thermal double wall construction features non-leaching glass inside and a large, easy grip handle. The fine stainless steel mesh filter is ideal for roiboos and herbal teas. 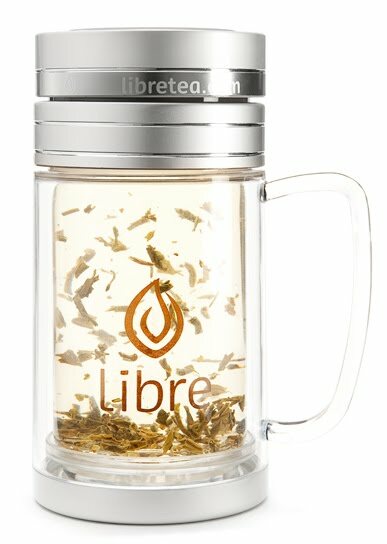 The health-conscious inner glass wall of these unique tea travel mugs is BPA-free with no potentially toxic chemicals leaching into your tea. The exterior of the mug is made of safe and durable polycarbonate plastic that's on-the-go friendly. A built-in stainless steel fine mesh filter keeps tea leaves in the tea and out of your mouth. It works just as well with tea bags. The filter is easy to remove for quick access and easy cleaning when adding or emptying loose leaf tea. The clear walls allow you to see through to your tea as you enjoy it! The lid and drinking lip on this tea infuser mug are both BPA-free and the double wall construction ensures your hot tea stays warm for about an hour. Similar in design to our popular Travel Tea Glass, the Travel Tea Infuser Mug is slightly shorter and wider for a large stable base and features a handle for easy gripping. The mug style is great for home and office and 'on the go'. Simply add hot water to enjoy your favourite loose leaf tea. Say no to single use disposable cups for your tea when you're out and about - take your travel tea infuser mug instead! The travel tea infuser mug is available at online eco boutique Lavish & Lime. For more greener living ideas, visit www.lavishandlime.com. If you have any thoughts or comments about tea travel mugs or on-the-go drinking in general, please leave a comment below. We'd love to hear from you! nice mug i love travel mugs.because your tea long time save and hot.nice post.